The Deluxe Seed Sowing List™ is a designed to help yu get focused and clear on the direction in which your money will go and grow! Sowing into the lives of others via business and generally helping those in need is a MUST if you are to have the wealth portals opened for you. 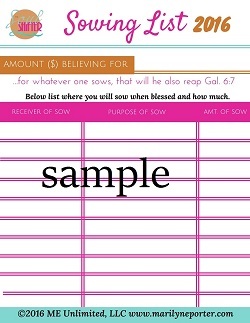 The Deluxe Seed Sowing List™ is a easy way to write your GIVING vision. I've tried this method myself and it works, and so I wanted to offer you the opportunity to get moving with your seed sowing. P.S. Faith with Works is the only water required for seed that you sow to grow!